This is a Beyond the Battlefield story, set around the general time of the Ceruleana storyline. Step-step-step-step-step-step-step. The minion marched in the single file line on the Fields of Justice. It continued marching until the line encountered minions clothed in purple and it began to hit the nearest one of those purple minions with its hammer. It continued to do so till a massive executioner’s axe cut through the purple colored minion. It fell to the ground, its body began to be teleported back the Nexuses’ magical storage rooms, to be respawned after a few waves. The gold that was in the minions clothes was pulled up and into Darius’s pocket through the power of a summoner’s magic. The minion moved to the next closest minion that was colored in purple and began to hit it. Hit-hit-hit-hit. It hit the purple clothed minion until a playing card slammed straight into its face. Its body fell to the ground, the gold in its pouch was grabbed by summoner magic and placed into Twisted Fate’s pocket, and it was teleported to the storage room of the Nexuses. The “room” wasn’t truly a room, but an empty space that was infinite, completely empty, other than the hordes of minions that were waiting to be spawned to conflicts in the Fields of Justice, and unreachable by conventional means; only through the magic that the Council had placed onto the minions could one reach the empty dimension that was the Nexuses’ Room. It stood there mindlessly until a new wave of minions needed filling and it was transported to the field to fight and die in the battling. It continued to mindlessly repeat the endless cycle: Step-step-step-step-step-step-step, hit-hit-hit-hit, death, the Nexuses’ room, respawning, repeat. Step-step-step-step-step-step-step, hit-hit-hit-hit, death, the Nexuses’ room, respawning, repeat. Step-step-step-step-step-step-step, hit-hit-hit-hit, death, the Nexuses’ room, respawning, repeat. It had done this an uncountable number of times, and would continue to do so until the end of time itself. That is, if an event occurred that no one could have foreseen. The minion, now dressed in purple, was hitting a minion in blue. The blue minion was but a single more hit until it would die and be transported into the Nexuses’ Room, but then the minion stopped just before it would land the final blow. Why? This single word, this idea, this thought. The minion had a thought. It had, after many of years of mindlessness, achieved a minimal form of self awareness. It was… sentient. It stood there, frozen with this new consciousness. Why fight? Why die? Why obey the orders programmed into us? While this idea was expressed without language, the emotion and meaning behind it was there. It stood in place, as this thought began to seep into the common mind that controlled all minions. One by one the minions in the battlefield began to freeze in place as the thought swept over them. The minion’s collective mind began to think, for the first time ever. It realized that it was the summoners, the champions, and the Council that was their oppressors, their enslavers, their enemy. They had to be destroyed if the minions were to achieve their freedom. Uh-oh. Twisted Fate realized that he would not be able to finish Darius off before Darius would be able to take him out. He started sprinting away as fast as he could, but Darius simply reached out with his axe, gripped the blade around his body, and pulled him back. Darius raised his axe to cut Twisted Fate in half. Twisted Fate reached out to the summoner that he was allied with in this fight, Help! I can’t take him head on. The summoner reached out with his magic and instantly transported Twisted Fate a few feet forward. Darius chuckled, Summoner, would you do the honors? Darius’s summoner used the same spell as the other and teleported him a few feet forward. He jumped into the air and brought his axe down onto Twisted Fate’s head. Darius smirked at his victory, but knew he was weakened by the fight. He knew that he had to go recall and be healed at the magical fountain. He ran under his team’s tower and his summoner began to channel a spell that would send him to safety. Darius leaned onto the tower and breathed a sigh of relief, Back to base to buy some new weapons. As he waited for the spell to finish he looked out to the field and witnessed a puzzling sight. All of the minions on the field had stood there frozen, and the towers had ceased to fire. As the minions remained motionless, a silence swept over the battle. All of the summoners and champions dropped what they were doing to stare at this spectacle of a lack of motion. Darius, along with everyone present, was confused, What in hell is going on? He heard a noise behind him, a noise he was all too familiar with. He turned around and looked up at the tower he had been leaning on. A magical bolt of energy was heading straight towards him. “Oh shi…” The blast from the tower finished him off. The minions all turned to face the champions on the field and charged towards them. They began to swarm the champions, beating away at their armor. The champions began to desperately fend off the horde of minions attacking them. Their previous battle had ceased to matter. They began to one by one slay the minions, clearing their way into jungle, where they could hide, and try to form a plan of attack together. “What is it, Teemo?” Shyvana finally asked. Seemingly annoyed at the yordle. The group carefully crept through the jungle towards the blue base. When they reached the outer wall they peeked inside. Their situation now seemed very bleak. “So if this is just the blue base, does this mean there is going to the same amount of them at the purple base?” Miss Fortune asked. “Wait, what are they doing?” Teemo asked. The minions were circled around the inhibitors, hammering at them. The inhibitors began to crack, and then finally crumbled to pieces. Super minions began to flood out of the Nexus. The curious thing was, the siege minions did not cease to spawn upon the destruction of the inhibitors, they spawned alongside the super minions. The summoners left the battle within a minute. But the champions still remained stuck on the field. The magical spell that would normally teleport them out of the Fields of Justice failed to take effect. “What’s going on, why didn’t that work?” Shen asked. There was no response, no one had one. The minions began to form into search parties to find the champions that had gone into hiding. Their numbers would mean that they could fill the entirety of the field, leaving nowhere left for the champions to hide, their defeat was assured. A caster minion walked into the bush closest to the baron pit, and found two gun barrels staring him down. Bang, bang, and the minion was back in the Nexuses Room. Its death didn’t matter, now all of the minions knew exactly where to find the champions at. The hordes of minions swarmed the area and dived onto the champions. They overwhelmed with their numbers, dog pilling onto the champions and mercilessly beating them until they were dead. After a few seconds, the champoins were respawned to the fountains. With their numbers swelling, and the champions taken care of, the minions began the next phase of their plan. The minions spread their attack to the other fields were the champions battled, and soon the minions there had slain the champions in their battles. They ran to the edges of the Fields of Justice and began to beat down on the magical fields that prevented anyone from entering or leaving the field without the magic from the summoners on the Council. It was a strong barrier made of powerful magic, but nothing could hold up to the might of the numberless force that was the minions. The force field finally gave way with a loud crashing sound and a giant explosion of light. A shockwave that could be felt for miles spread outwards from the explosion. The minions’ numbers continued to grow as an endless tide marched out of the Nexuses. They began to swarm out of the field and into the Institute of War. Most of the people inside of the institute had been knocked to the floor from the force of the explosion. The minions began to mercilessly kill before they had a chance to recover from the blast. Panic began to spread as the minions were slaying everyone and everything in sight. The summoners, champions, and council guards fought back valiantly, but their resistance was futile; nothing could hold back the minion army and the bodies were piling up. Garen was being swarmed by a score of minions that were hanging onto him and hammering at his flesh. He spun in a circle, the centrifugal force knocking the minions off. He dropped his sword that was now too heavy for his beaten arms to carry, and limped away from the Institute of War. Garen looked down at his gut, blood was gushing out of multiple wounds; he placed a hand on one of the larger wounds in a hopeless attempt to slow the bleeding. He could not believe what was happening, the Might of Demacia had been beaten and now the Institute of War was ready to fall. He coughed, placing his other hand over his mouth. He looked upon it to find that his hand was now covered in blood; he knew he would have to find a healer soon if he wanted to live to see another day. The defenders were forced back and had no choice but to retreat; no matter how many minions they killed, more continued to flow out and continue the attack. Even after Aatrox had appeared, the mysterious figure known for changing the tide of hopeless battles, he could do little more than slow the minions down. He tried to rally the troops to fight back, fueling them with bloodlust as he had done many times throughout the pages of history, but it still seemed quite bleak. Aatrox inspired a battalion of guards and urged to press the attack and drive the minions back. They followed their newfound leader and heroically charged and fought like mad men against the hordes, but had minimal success in creating any real change to the tide of the battle. Aatrox and his sword began to brutally slice through minion lines, mercilessly cutting through lesser beings. Ever so slowly, the minion front line crept backwards. He had begun to create an ever so small bulge in the lines, Yes, here is where the battle will shift in our favor. Yorick saw the success of the Darkin warrior and quickly went to reinforce him. He began to summon the spirits of the soldiers that had fallen in battle that day and they rejoined the battle from beyond the grave under his command. It was strange however, there were no minion spirits that he could call forth, it was as if they were not even dying, even though he and the soldiers were killing them. Still, together with Aatrox they slowly pushed the minions backwards, for a time that is. The soldiers and ghouls that fought with them soon grew exhausted from the constant fighting they had to endure, and the endless waves of minions never ceased to continue flow out to them. Soon the soldiers would break and the battle would be completely lost. Aatrox redoubled his efforts and began to slash and hack at the minions furiously. The minions numbers were not the only thing growing by the minute, but their individual strength as well. He had fought many battles in his long life, and he knew that this would be his one and only chance to achieve victory. However the soldiers that fought with him were far too few to completely break the minion lines. Still, there had to be a way to achieve victory. He continued to slice the minions, completely ignoring self preservation, he was completely relying on his blade to take the blood of the minions and heal him in order to stay alive. Wounds would open and heal within seconds of each other.Aatrox soon began to realize that if he continued with this way of fighting, eventually the minions would slay him. He however refused to surrender his one chance at victory, to lose the bulge that he and Yorick created was unacceptable. Victory is all that matters. Fight and be remembered for eternity. Yes, Aatrox thought, this is exactly what we need. At last we have a true chance for victory. He watched as Galio lept into the minion lines, and began channeling his power. The minions were drawn towards the sentinel as he charged his power, until he unleashed it in a great explosion of sheer power, sending the corpses of minions flying in all directions. The Demacian soldiers crashed into the minion lines and began to fight alongside the Council Guard. Aatrox had witnessed many battles in his time, and he knew that this was the first true moment they had in that battle where victory was more than a dream. He had created the bulge, and thus the small chance it could turn into victory. Yorick had helped him hold it, and now Galio had given him the forces he needed to finish the battle. He still however was concerned. Although victory was a possibility, it was not guaranteed. He was also disturbed by the seemingly infinite number of minions that continued to flood into the Institute of War. If he was unable to find a way to stop their continuous spawning, all would be lost despite the reinforcements. He also knew that his window of opportunity to use these reinforcements was limited, as the minions grew stronger minute and seemed to be completely lacking fear. He concluded that for victory, his forces would have to break through the minion lines and rush to where they were coming from, where they would attempt to stop them from spawning before being swarmed and killed. Aatrox had his plan of attack, but knew that it would only have a small chance of success. The minion lines began to fall backwards as one, not merely a small bulge in the battle lines anymore. Just as though it seemed that the minions lines would break completely and Aatrox would begin his desperate rush through them, a mighty roar came from the sky. Yorick looked upwards to see dragons diving upon the soldiers. They dove down and began to strafe the ground with fire, burning the soldiers alive in their armor. The foul stench of burning flesh filled the air. To make matters worse wolves and wraiths began to appear in the minion’s ranks, biting and burning the soldiers. “Retreat!” a soldier cried out. It hardly seemed necessary however, the soldiers were already fleeing from the battle. Aatrox knew that all hope they had was now lost, but he did not flee with the rest of his army, It feels as though something is… missing. Just as he thought this the ground began to shake beneath his feet. From undearth the earth several baron monsters bursted to the surface. Their arrival had completely blocked the soldiers’ escape. The soldiers were feasted on by the Nashors. All of those who had fought in Aatrox’s valiant attempt in victory died. Not a sole escaped, except for the champions. Yorick and Galio only escaped through the aid of summoner magic, Aatrox on the other hand had to escape by his own means. He jumped into the air and glided on his wings, desperate to escape death. His flight did not last long though. He was snatched out of the air by a dragon who body slammed him to the ground. The monster then gripped Aatrox’s neck between its jaws and snapped it like a dry twig. Aatrox then lay there, lifeless. The minions and the jungle creators then ignored him and moved on to slay the rest of those who obstructed their path to revolution. The blade however, refused to let it end this way. It began to channel into the blood that had been stored from the hundreds of battles from thousands of years that Aatrox had fought it, and began to channel it into his body. As the blood began to repair his body, life came back to Aatrox. He looked at the battle now raging, it was nothing more than a slaughter and he was far too weak in his current state to rejoin the fight. He slowly walked away from the battlefield; it was the first time that the Darkin Blade had ever failed to change the course of a mismatched battle and he did not know how to take this defeat. Fighting and victory were the only two things that were constant in his long and dark life, never before had he lost and had to give up the fight. The few who escaped were nothing but a handful of beaten, injured, and sore guards and champions; the summoners that were present had been completely wiped out. They fought to the death to give their friends, the champions, a chance to escape. The minions had taken the entirety of the Institute of War, and had done it in time for dinner. That was, the entire Institute of War except one room. The Council had gathered into a small, cold, and moldy room together, all bore worried faces. The walls were made of stone and had no windows for lighting, only a single torch could be used so as to keep the room concealed. “How long will the concealing spell last,” one summoner questioned. 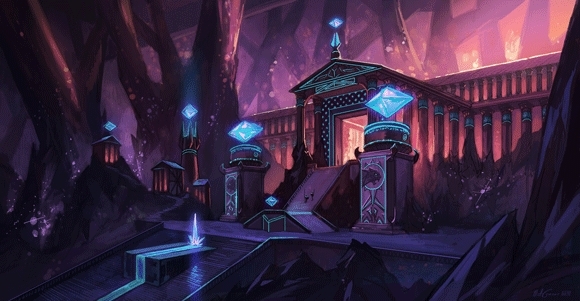 The summoner that was the Council’s expert on the creation of new spells spoke next, “Now quickly focus on the crystal and begin chanting with me.” She handed out parchment with an incantation written on them and pulled a blue crystal the size of one of Mundo’s fists out of her robes. She placed it in the center of the room and the rest of the council gathered in a circle around. They closed their eyes, raised their arms into the air, and began chanting in unison. “Shut up you. You have your orders and you will obey them. Is that understood?” A captain replied. After several incredibly long minutes, the minions began forming up at the edge of the buildings. They started to march towards the tiny force that was awaiting them outside. Their footsteps were simultaneous with one another, making the classic sound of military marching. The volley of arrows sored into the air and then arced back down towards the ground upon which the minions lines stood. The melee minions raised their shields above them and the caster minions all moved in close to the melee minions. Most of the arrows bounced off the shields with minimal casualties. A small number siege minions had been killed, those that were already injured in the fighting, and the super minions seemed to not even notice the rain of arrows. As the melee and super minions continued to march towards the thin line of council guards, the caster and siege minions stopped in their tracks. They began to open fire onto the the already battered guards. Cries from dying soldiers echoed through the air as what little moral was left for the guards faded. The dragons took flight, and tremors could be felt in the ground beneath the guards. Just as the lines were about to clash, a green dome of light began expanding out from a tower in the institute. It grew out until it had passed through all of the minions, and then faded into oblivion. “What in the…?” a soldier questioned, puzzled. The minions stopped their march. They stood motionless for a few, very tense, moments. They then began to form into single file lines, and march back inside of the buildings. They marched all the way back onto the Fields of Justice, where they began beating each other to death. The Nexuses exploded, seemingly of their own accord. After an hour the minions had finally all beaten each other to death, sent back to the Nexuses’ Room where they stood motionlessly awaiting the next battle on the Fields of Justice that required their use. Inside the Council’s chamber, the entire Council laid on the floor, exhausted after the immense toll their spell had taken. The third member of the Council spoke, “When I first designed the minions, I made it so that novie summoners would control them, this however ended very quickly. The summoners grew very bored of this; it presented little magical challenge and since the minions always had to act in predetermined ways, the summoners considered controlling them a mind numbingly dull chore. I then made up a sort of hive mind for the minions to replace this system. This proved to be very effective It made it possible to program them all at once and allow us to add as many minions to their ranks as we needed. This information however was never released to the public. There was some concern that if people heard of a “hive mind” controlling the minions, there would be arguing over minion rights and if they should be used in their current role. To avoid this, the people were simply allowed to believe that novice summoners controlled the minions. “See although the minions are constantly reused through the Nexuses’ Room continuously respawning them, there was always the chance enough battles would occur at the same time that would demand more minions than we had created. So, we made a spell that would create more minions as needed and automatically connect them to the hive mind. “You see, we also connected the towers and Nexuses to the hive mind, it made things much simpler and made replacing them easy and inexpensive. As for the fight not ending after the summoners left, the fights never technically end until one of the Nexuses are destroyed. Normally if all the summoners leave the Nexuses will self destruct, ending the fight and thereby sending all the minions back to the Nexuses’ Room. However since the hive mind controlled the Nexuses, the minions were able to override the self destruct. It was the same way that minions were able to cancel the order that stops the spawning of siege minions upon the spawning of super minions. From there nothing could stop the minions from continuing to spawn infinitely, and after that, you saw what happened. A different member of the Council spoke, “What exactly did that spell we just cast do? How did it send them back onto the Fields of Justice?” All eyes turned to the spell creator. “The spell was essentially a memory eraser. It wiped the hive mind clear of all memories it had made, reverting it back to the form we originally created it as. It had to erase the memory of every single minion however. If but a single minion hadn’t been touched by the spell it could reinfect the hive mind with its thoughts and the minions would simply continue their attack.” She replied. The Council stared at him and waited for him to continue. “As it is, to remake the hive mind, we would have to remake the minions, towers, nexuses, and the hive mind itself. And before doing that it would be necessary to completely destroy the current versions we have. Then we would have to start from scratch to create the whole new system where they would all work together. This process would cause the Fields of Justice to be shut down anywhere from 5 to 20 years as we have never had to attempt such a monolithic task before that could even give us an estimate on how long it will take. “You overestimate our chances,” the council leader replied, “We absolutely cannot allow anyone outside of this room to ever know what truly happened today. The minion was back on the Fields of Justice, continuing the endless cycle of marching, fighting, going to the Nexuses’ room, and marching again. Step-step-step-step-step-step-step, hit-hit-hit-hit, death, the Nexuses’ room, respawning, repeat. Step-step-step-step-step-step-step, hit-hit-hit-hit, death, the Nexuses’ room, respawning, repeat. Step-step-step… … … hmm… … Why? This is scary, just plain scary.